The Republic of Kiribati, The Marshall Islands, and Tuvalu have a combined population of under 200,000, with nearly 1,200 individual islands spread across an area of over 2,000,000 square miles. When the term "remote" is used, these islands and their peoples would fit the definition perfectly. These islands are in the Northeastern sector of the Sea Mercy target zones. We believe the health care needs of these three island nations is evenly balanced. Their location is such that one floating clinic would be able to cover the more neglected "remote islands" needs in a one year time period. The Republic of Kiribati is an island nation located in the central tropical South Pacific. Kiribati (pronounced "keer-ah-bhass") consists of 32 low-lying atolls and one raised island scattered over an expanse of ocean equivalent in size to the continental United States. The islands straddle the Equator and lie roughly halfway between Hawaii and Australia. 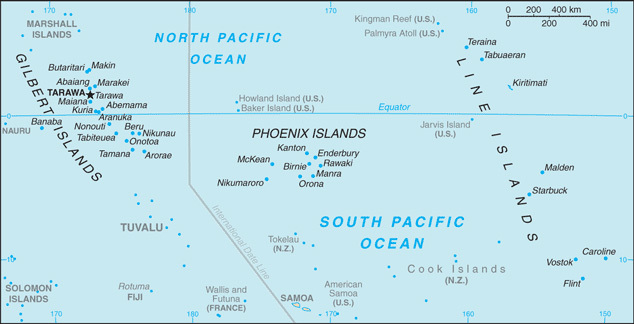 The three main groupings are the Gilbert Islands, Phoenix Islands, and Line Islands. In 1995 Kiribati unilaterally moved its date line to include its easternmost islands, putting the country in the same date and time zone. The largest donors of development assistance to Kiribati are Japan, the European Union, Australia, New Zealand, and Taiwan. U.S. assistance is provided primarily through multilateral institutions. As of early February 2012, domestic airlines had ceased regular scheduled flights, and most of the populated atolls in the Gilberts were only accessible by boat or charter aircraft flying from Tarawa. Small ships serve outlying islands, including in the Line Islands, with irregular schedules. Telecommunications are expensive, and service is mediocre. The immunization rates for children under one were as follows: diphtheria, pertussis, and tetanus, 97%; polio, %; measles, %; and tuberculosis, 93%. The Marshall Islands, officially the Republic of the Marshall Islands is an island country located in the northern Pacific Ocean. Geographically, the country is part of the larger island group of Micronesia, with the population of around 68,000 people spread out over 34 low-lying coral atolls, comprising 1,156 individual islands and islets. 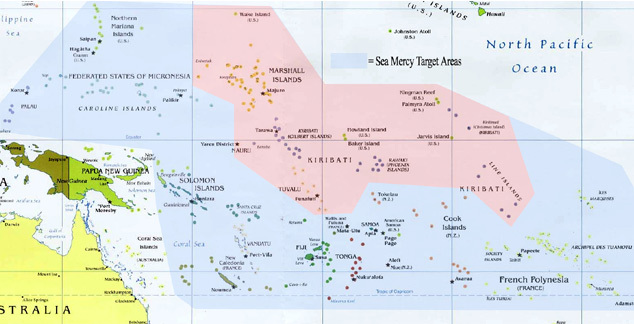 The islands share maritime boundaries with the Federated States of Micronesia to the west, Wake Island to the north, Kiribati to the south-east, and Nauru to the south. 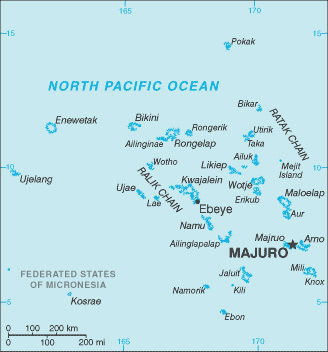 The most populous atoll is Majuro, which also acts as the capital. The immunization rates for children under one were as follows: diphtheria, pertussis, and tetanus, 94%; polio, 95%; measles, 97%; and tuberculosis, 93%. 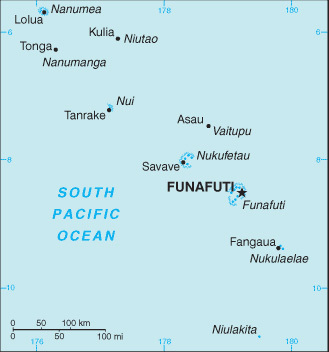 Tuvalu, formerly known as the Ellice Islands, is a Polynesian island nation located in the Pacific Ocean, midway between Hawaii and Australia. Its population of 10,544 makes it the third-least populous sovereign state in the world, with only Vatican City and Nauru having fewer inhabitants. In terms of physical land size, at just 26 square kilometres (10 sq mi) Tuvalu is the fourth smallest country in the world, larger only than the Vatican City at 0.17 sq mi, Monaco at 0.76 sq mi and Nauru at 21 km2 8.1 sq mi. The immunization rates for children under one were as follows: diphtheria, pertussis, and tetanus, 89%; polio, 89%; measles, 85%; and tuberculosis, 88%.